It did not take long. 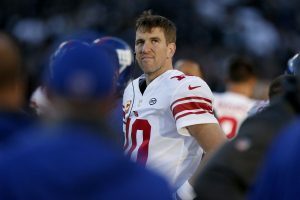 After being benched for one NFL game, Eli Manning was officially reinstated as the starting quarterback for the New York Giants. Steve Spagnuolo the interim head coach for the Giants made the announcement after the team practiced on Wednesday for just the first time since the organization fired head coach Ben McAdoo and Jerry Reese the general manager. Manning took snaps with the first team at practice on Wednesday and will be under center to start Sunday against the Dallas Cowboys at home. Last week’s starter Geno Smith will return to his backup role and rookie signal caller Davis Webb will remain as third-stringer. Manning said he was excited to be back starting after missing one game. He said he looked forward to playing against the Cowboys and back on the field with his teammates. Manning was the starter through the season’s first 11 games before Smith took the reins last Sunday. The Giants lost 24-17 to Oakland in that game, which led to the firing of McAdoo. The decision to return to Manning was made by Spagnuolo, but he discussed it with John Mara the co-owner when the Giants named him as the interim coach. Spagnuolo was the defensive coordinator for the Giants before becoming the interim coach and was focused so much on that side of the ball that he needed to confer with his coaches and Mara and everyone agreed Manning should be the team’s quarterback. Spagnuolo indicated that Smith was upset about being demoted to backup but was professional when it was discussed. Smith was the starter Sunday and did not do anything to forfeit his starting role, said McAdoo following Sunday’s loss. However, when the Giants fired McAdoo, it became apparent the team would return to Manning as the starter. Mike Sullivan is the new offensive coordinator, at one time was the quarterbacks coach for Manning and admitted that last week the situation had been frustrating. Mara has said that if Smith started this week against Dallas at home, fans would likely have reacted negatively. He added that the benching of Manning by McAdoo did not play a part in deciding to fire him or Reese. In his first public statement since being fired, McAdoo said it had been a privilege and honor to have been the New York Giants head coach and with the organization four years.